Friends…This is YOUR Emmaus Community. It cannot operate on the efforts of a few. Though the Board is small in number, they have been given the authority to make difficult decisions on your behalf. They cannot build or maintain this community on their own. We need your help. When your walk weekend ended, your commitment to the community did not. Your presence is needed at Gatherings and during subsequent walk weekends. Your witness is needed to bring others to desire to experience God’s grace in their lives through their own walk. Your efforts are needed to help the community grow through fundraisers and donations. With monthly Gatherings of 25-30 people and help hard to find during walk weekends, we are in dire straits. Our bank account is seriously depleted. Without your help, our future is uncertain. If we have 25 people on a walk, we generate approximately $3,250 in income. For each pilgrim, we are obligated to pay the Upper room (the governing body of Emmaus) $13. Our lock box is currently $84 per year, liability insurance is $1017.00, CCLI (To cover music copyrights) is $116. Expenses for the last walk were over $3,000. So, you see, our funds do not stretch far enough. I thank you for your prayers and for considering how you can help to grow our Emmaus Community. For all Walks please submit registrations as soon as possible, so the Registrar and Sponsorship committees can properly do their duties in preparation for the walks. Hear God as He speaks to you and encourages you to invite someone on this journey. The May Gathering to be held on the 20th due to Mother’s Day being on the 13th. 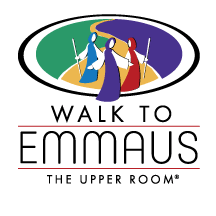 To attend an Emmaus walk, you must have a sponsor – someone who has previously attended the weekend and is willing to support you in love, prayer and service. If you know someone who has attended the walk, please feel free to talk to him/her. If you are interested but do not know anyone who could serve as your sponsor, please email any of the Emmaus board members and we will help identify a sponsor. The listing of the Emmaus Board and email information is available on this site.